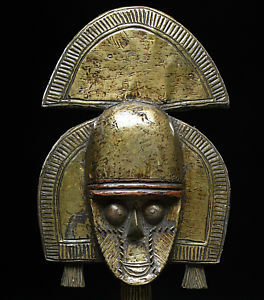 Types of Art: Wooden figures, often worn or carried in the form of masks, are used by the initiation societies to educate initiates about the role of the spirits whom they represent. Large wooden serpent figures appear at initiations, and carved anthropomorphic figures are placed on shrines. The ancestors are represented in figures that embody both human and animal characteristics. Geographically the Baga belong to the coast, yet their art is more stylistically akin to that found in the Western Sudan region. Religion: Religious life among the Baga is focused primarily on lineage-based men's and women's societies. The creator god is known as Kanu, and the highest recognized spiritual being other than Kanu is Somtup, the male spirit who governs the men's initiation society. The female society is governed by a-Bol, the wife of Somtup. Shrines are also kept by individual families in an effort to remember and appease the ancestors. Elek are carved shrine objects, which symbolize the lineage and offer protection for the family.